Salem, IN (July 31, 2017) – Two time ARCA/CRA Super Series Powered by JEGS Champion Travis Braden got his second straight ARCA/CRA Super Series win of the 2017 season in Sunday’s Rapid Fire Pizza 125 Presented by Hot Head Burritos at Kil-Kare Raceway in Xenia, Ohio, just outside of Dayton. 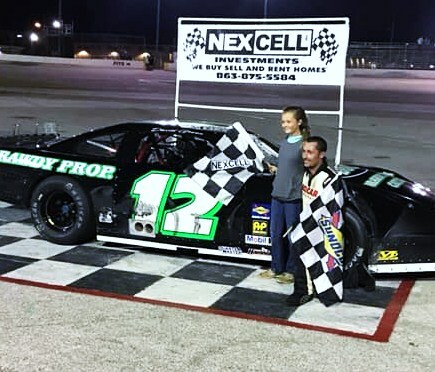 Braden picked up his first win of the season with the series on July 21st at Lucas Oil Raceway. Braden competed weekly at Kil-Kare back when it conducted weekly events, and won the first ever ARCA/CRA Super Series event at Kil-Kare back in 2013. Braden was happy to get back to victory lane in the series first visit to Kil-Kare since the 2014 season. Series points leader Josh Brock grabbed the early lead from his pole starting position after EDCO Welding Fast Qualifier Justin Alsip drew an eight for the events inverted start. 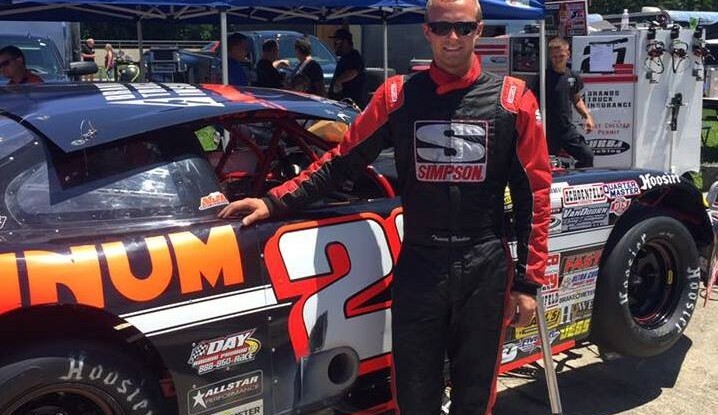 Brock was able to pull away from outside front row starter Greg Stapleton. 2014 series Kil-Kare winner Brandon Oakley quickly got by Stapleton and set his sights on running down Brock. Oakley powered by Brock to grab the lead on lap five and immediately started to pull away from the field. Braden started patiently working his way through the field from his seventh place starting position to move into second and set his sights on running down Oakley. Braden was able to close on Oakley while the two threaded their way through lap traffic. Oakley got stuck behind the last cars on the lead lap, who were battling for position themselves. Braden made a quick move to the inside to get by Oakley and a couple of cars battling for position to grab the lead on lap 64, earning the AR Bodies Cool Move of the Race Award. Braden and Oakley made some contact, but both drivers gathered in their cars and continued to race without incident. Things came to a screeching halt on lap 71 when Cody Robinson’s machine went up in flames from a blown engine, bringing out the events first caution and eventual red flag for an extended clean-up of oil on the track. Robinson managed to get out of his burning car without incident as the track safety crew quickly extinguished the flames. The field went back green for only one lap before the second caution flew for a spin by Oakley while battling for second with David Carter. Stapleton and Hunter Jack spun after the caution flew. Oakley and Stapleton were able to continue but Jack’s day was over. Braden kept the lead over Carter on the lap 73 restart, quickly pulling away for a sizable lead over Carter. The race went all the way to checkers from that point with Braden getting the win. Braden picked up a Hoosier Racing Tire Performance Award for his win coming from his seventh place starting position. Carter would finish in second, his best ever finish with the ARCA/CRA Super Series. Carter picked up the FLUIDYNE High Performance Cool Under Pressure Award. Senneker Performance Rookie of the Year candidate Logan Runyon finished in third, also his best ever finish with the series. Runyon picked up his third Senneker Performance Rookie of the Race Award of the season, tying him with Brock for the most rookie awards so far this season. Local competitor Drew Charlson came from his ninth place starting position to finish in fourth place, earning the Sweet Manufacturing Sweet Move of the Race Award. Alsip would finish in fifth place after going to the pits, where his crew made adjustments to the car after falling back through the field earlier in the event. Alsip would fight back to finish just inches ahead of Donnie Hill. Alsip’s crew picked up the PitBoxes.com Pit Crew of the Race Award, first for their efforts to get Alsip’s car ready for the event after suffering heavy damage in the July 9th JEGS/CRA All-Stars Tour event at Kil-Kare, then making the right adjustments on Alsip’s car so he could get his fifth place finish. Hill would finish in sixth after starting 14th earning a Hoosier Racing Tire Performance Award and the Hamner Racing Engines Hardcharger Award. Brock would finish in seventh, Oakley in eighth, Chad Pendleton in ninth and Stapleton in 10th. The next ARCA/CRA Super Series event will be the Kalamazoo Klash 125 on Wednesday, August 9th at Kalamazoo Speedway. More information on all the CRA Series is available at www.cra-racing.com.